The VIC2004 meeting is over and was a great success! Our thanks to all who participated. A short summary of the conference. The book of abstracts, which includes abstracts for (almost) all of the talks. The timetable, which links to individual abstracts. Slides from some of the talks. A slide show of pictures taken during the conference. Full size versions of those pictures. The pictures were taken by Catherine McCartin and Wolfgang Merkle. In 2004, Victoria University will be hosting an international meeting in cooperation with the Israel Mathematical Union, the New Zealand Mathematical Society and the New Zealand Institute of Mathematics and its Applications. The Royal Society of New Zealand is providing additional funding and Educational Computers (New Zealand) is sponsoring the meeting. There will be a number of themes at the meeting, but it will especially be working in conjunction with the six month Logic and Computation programme of the NZIMA. Check out the online Timetable for the most up-to-date information. There will be a reception at Weir House (the main conference accommodation) at 6pm on Sunday 8 February. Food and drink will be provided. This will also be an opportunity to collect your information pack. Please see the Victoria University Kelburn Campus map. Weir House is off the right of the map, on Salamanca Road next to the cable car. You can also locate the University (number 28, at the top) on the Wellington City map. Lectures will be held in the Hugh Mackenzie Lecture Block on the Kelburn Campus. All lecture theaters will have chalkboards, whiteboards, two overhead projectors and data projection facilities. Abstracts are available through the Atlas Mathematical Conference Abstracts service. There will be seven special sessions. For details on who will be speaking at these sessions, see our Special Sessions page. Computational Complexity, organized by Rod Downey. Surface Approximation, organized by Shayne Waldron. Geometric Aspects of Functional Analysis, organized by Vitali Milman and Vladimir Pestov. Operator Algebras and Representation Theory, organized by David Kazhdan and Chris Atkin. Nonlinear Analysis and Optimization, organized by Bruce Calvert. Game Theory, organized by John Hillas, Arkadii Slinko and Matthew Ryan. Functional-Differential Equations and Applications, organized by Bruce van Brunt and Gregory Derfel. There will also be a small number of Contributed Talks. Please register online. Note: even students and invited speakers need to register. The nominal cutoff date for registration was November 1st, 2003. The registration fee is free for students, and NZ$150 otherwise. There is an additional NZ$50 fee for the conference dinner (NZ$20 for students). If you have requested accommodation at Weir House, the cost for this will be included with your conference fee. Please send payment as soon as you can. The prefered method of payment is a bank transfer into the University's account. Contact Ginny Nikorima (ginnyn@mcs.vuw.ac.nz) for details. For credit card payments, e-mail your information to Ginny Nikorima (ginnyn@mcs.vuw.ac.nz), fax them to Ginny at ++64-4-463-5045, or phone them through on ++64-4-463-5341. The following details are needed. Amount to be Deducted $NZD. You must also clearly state that the University is authorized to deduct the amount shown. Cheques should be made out to "Victoria University of Wellington". We have booked rooms at Weir House from the 8th until the 13th (6 nights). This is available as Bed and Breakfast, at the rate of NZ$48 per person per night. Weir House is a student hostel, with single rooms (and thus, it is not really suitable for couples, unless you are willing to sleep in separate rooms). It is about three hundred metres from the University. If you wish to stay at Weir House, you will need to indicate this on your registration form, and book through us. James Cook Grand Chancellor: NZ$180 per night. Duxton Hotel Wellington: NZ$332 per night. 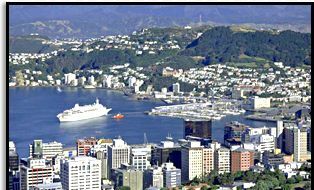 Novotel Capital Wellington: NZ$135 per night. Portland Hotel: NZ$147 per night. offers serviced apartments with cooking facilities, and has a good rate for University guests. There will be a half-day group outing as part of the conference. This has not been finalized yet, but this will probably be a harbour cruise, or perhaps a hike up a mountain, or a trip to a winery (or wineries). The International Rugby Sevens take pace in Wellington on 6-7 February. Rugby is a national obsession in New Zealand and the the Kiwis have dominated the sevens recently, so come a few days early and see the action. Information is limited now, but the offical site will eventually be updated.